On a recent trip to Omaha I visited Omaha Bicycle Co. What motivated me to seek out the shop? The shop is owned and operated by a woman. A rare find! They were recently awarded best coffee shop in Nebraska by Spoon University. Yep! This isn't just a place to purchase a bike, have it repaired, or grab a spare tube. Sarah Johnson's team can also craft a perfect pour-over or espresso beverage. With coffee outside gear in their inventory, I was specifically after a camp cup to add to my personal kit. Rivendell bicycles will soon be available to admire in person, and of course purchase. Currently no other shop in Iowa's or surrounding states carries these beautiful bicycles. If you're not familiar with Grant Petersen or Rivendell Bicycle Works take some time to explore their website. The store is everything I've read about. The cozy color palette and comfy spots to hang out gave it a homey feel. My iced latte was as delicious as expected and a coffee cup was bought as a souvenir. From the looks of the eclectic group of coffee mugs on display, the Mug Club looks like a fun bunch of folks! A woman's touch is easy to find here too with cute shop onsies for babies and invitations to potlucks and group rides for women. With Benson Days taking place, it was a busy morning at the shop. Sarah was nice enough to chat with me for a few minutes. It was easy to understand why the local community is so supportive of her! Check out the links below for great write-ups on Sarah and Omaha Bicycle Co. The coffee. The bikes. The people. Last week my family traveled to Colorado for our summer vacation. With our first destination as Fort Collins I was excited to tour the city by bike. I had been reading so much about how bike friendly the community is and their fantastic trail network. Choosing to leave the Iron Giant at home my plan was to take advantage of the FREE service the city provides. Since 2007 the Fort Collins Bike Library has been providing a fleet of bicycles to visitors (along with residents and CSU students) who are looking for a safe, efficient, and fun way to travel around town. As much as I love exploring libraries filled with books, I was extra-excited to visit a bicycle library! There are several libraries around town. I chose the “hub” located at the Downtown Transit Center. It was easy to find and provided clean restrooms, air conditioning, and cold water fountains. The library had a wide variety of bikes ranging from commuters, tandems, cargo, cruisers and even vintage townies. There were bikes for kids too along with trailers, tag-alongs and striders. As the first patron of the day I was greeted by a friendly librarian who walked me through the signup process. He picked out the type of bike that would best suit my cycling needs, checked it over to make sure it was mechanically sound, provided me with a helmet and bike lock (also free), a bike map, and set me off on my way. I spent several hours riding around town and also the Poudre Trail. The bike was easy to ride and in good condition. I liked the comfortable upright position the handlebars provided and the cushy seat! It was fun spending time on a bike different from the one back home. Having completed my morning outing I returned the bike, helmet, and lock back to the library. Later that day I received an email thanking me for my patronage and providing me with an opportunity to provide feedback on my experience. 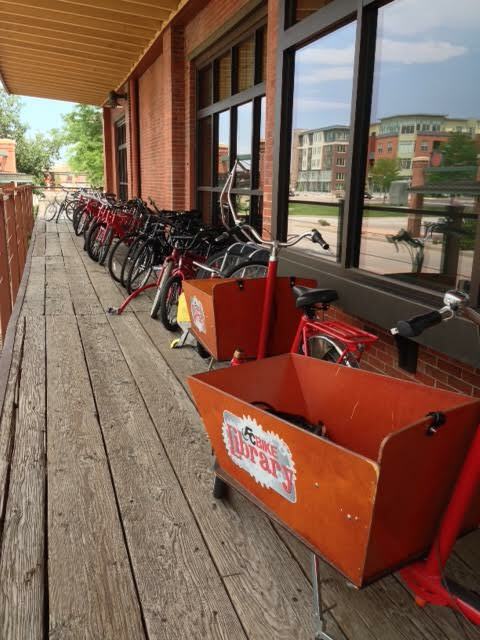 The Fort Collins Bike Library is great resource for visitors wanting to submerge themselves in the bike culture of Fort Collins, travel the network of trails, or enhance their tourist experience. The library is also a fantastic role model for other cities looking to promote biking as transportation. Every city needs one of these libraries. While riding the Raccoon River Valley TraiI I chose to stop in Perry to check out their LBS. Established in 2012 Raccoon River Valley Bicycle is found next door to Hotel Pattee. It is a full service bike shop carrying Trek bikes. Located just off the bike trail, this shop is a great resource for cyclists who may have left home without a repair kit, tube, or other cycling accessories. This shop is a beauty! Rich woodwork throughout the store and a glass alcove providing a fantastic spot for displaying bikes made this store unique. The cash register area had display of RAGBRAI badges and other memorabilia. The store coordinates group rides during the cycling season and offer text message updates to keep cyclists informed of bike events. Rental options are available for visitors who don’t own a bike but are looking try out the bike trail. Next time you’re riding through Perry take a break and visit Raccoon River Valley Bicycle. It’s only pretty bike shop! Beaverdale Bicycles is a neighborhood bike shop owned and operated by Ed Veak. It’s located in the heart of Beaverdale, at 2701 Beaver Avenue. I had been wanting to check out this bike shop for a while and finally planned a visit. I was glad I did! It’s a small store but has a great selection of biking accessories, parts, and even fun stuff like beer glasses and t-shirts. Some beautiful Opus bicycles were for sale as well. Along with your typical bike services and repairs, Ed can also customize your bike. Examples of his impressive work are in the 2014 edition of the Des Moines Bicycle Collective calendar and the shop’s Facebook Page photo albums. I had a conversation with Ed on the topic of bike maintenance. He recommended practicing changing a tire in the comfort of home until it's easy. Ed explained how being able to change a flat quickly comes in handy when you’re out on the trail in conditions that might not be ideal such as the cold, rain, darkness, or like what happened to him...surrounded by hungry mosquitoes! I had never considered practicing changing a flat before. Good advice! In my short visit it was clear Beaverdale Bicycles gets to know customers and personalizes their service experience. I was welcomed and felt I had made a new friend. If you’re looking for a bike shop where you feel comfortable no matter what your cycling expertise might be, plan a visit to meet Ed. You’ll be glad you did!